One of the most aggravating situations I see parents running into when they’re sleep training is the sudden onset of a minor illness when they’re finally seeing some progress. And then BAM! Baby gets a cold, or an ear infection, or a bout of diarrhoea, or one of the other seven thousand illnesses that babies are prone to, and the whole thing goes off the rails. 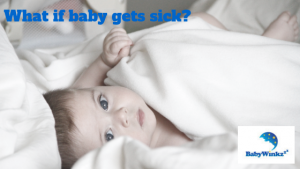 And given how often babies get sick, it’s hardly a surprise. I’m always telling my clients to plan on starting the program when they have a couple of weeks that they can really devote to the training, but you can’t schedule around an illness. So when it happens, it can really take the wind out of everyone’s sails. So today, I have a few suggestions for you in case this happens. Hopefully they can help you push through this trying situation and get you motivated to get back on track. First off, resist the temptation to bring baby into your bed. If you’re really concerned and want to be in the same room as them through the night, I suggest you bring an inflatable mattress or a camping pad into their room and sleep on the floor. Keeping them in their own room with familiar sleeping conditions will be much less disruptive than moving them into your room, and you don’t run the risk of them getting used to sleeping in your bed. Second, do NOT give in to the temptation to start offering any sleep props that you might have recently taken away. I know it’s tough, because obviously you want to offer them any kind of comfort you can while they’re feeling miserable, but you really don’t want to reintroduce those things they were dependant on prior to starting sleep training. It can be really confusing and is often even more difficult to break the association the second time around. Now, let me just point out that I’m not saying that you can’t offer more night time comfort to your baby while they’re sick. On the contrary, I completely recommend it. You should absolutely feel free to go in and check on them more often, take care of any needs they might have, and even give them a little cuddle or a rocking session in order to comfort them. Just be vigilant and be sure to put them back into bed before they fall back to sleep. Otherwise you run the risk of them developing those associations where falling asleep requires a rocking session or a cuddle, and then you’re back to square one. You may notice a slight regression when the illness has passed, but not to worry. Your baby has learned some great sleep skills at this point and will probably only need a slight reminder of how things go before they’ll be back into their routine and sleeping soundly through the night again. Just get back to the program, reintroduce the old bedtime routine, and you’ll be seeing those same wonderful results in no time. Vivian Lopez on Is Your Toddler Not Sleeping at Nursery? Daniel on Night light – Is it affecting my child’s sleep? I am passionate about helping families get the sleep they need to be happy and healthy. I am now a proud mum of two girls exactly a year apart in age. Back to School Tips Does Teething Affect my Baby’s Sleep?